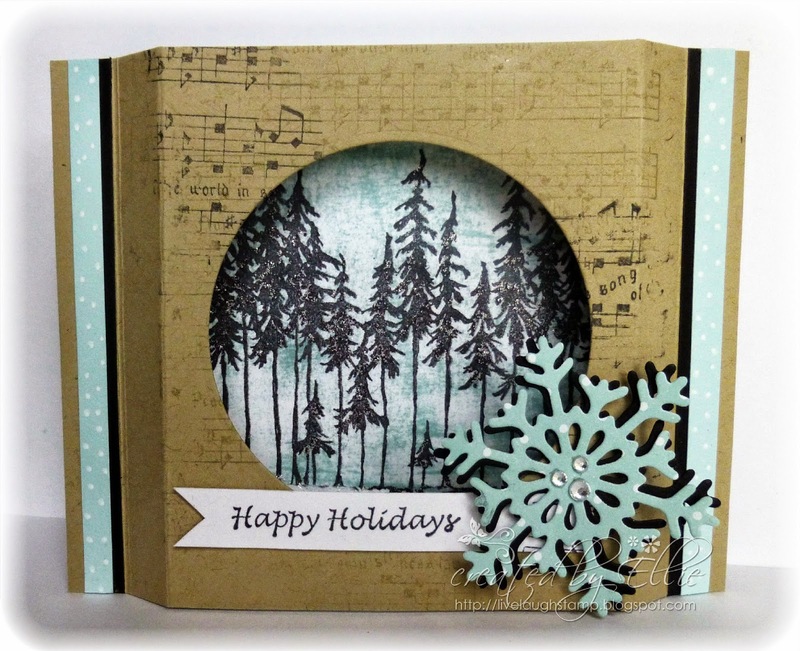 Yesterday was my turn to share something on the Just For Fun Rubberstamp blog, and I decided to create a shadowbox card. I've only made a few of these in the past, but they are so much fun to make and actually really easy. And they lay flat for easy mailing. Sorry I don't have any step by step photos, because usually when I make a card I don't really think about the design until I have started, and by that time my desk is just a complete mess, and no room for photographing. And I don't have good lighting in my stamp corner. But here are the simple steps for those of you that would like to know how it's done. I started out with two pieces of kraft cardstock, measuring 4.25 x 5.5 inches each. I scored these at 0.5 and 1 inches on the left and right side (shorter sides). 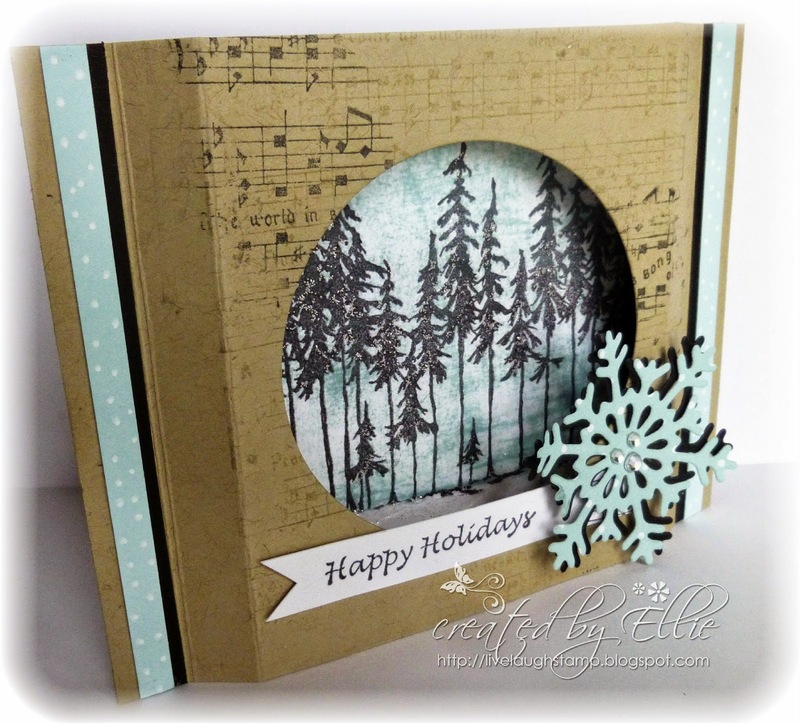 Next I cut a window out on one of the card stocks using a nestability die, which is going to be used for my top piece. As you can see, I used a background stamp on this card stock. You can also decorate this with designer paper if you wish. I adhered the stamped trees onto the other piece of card stock. (I cut the image panel to fit between the scored lines.) Next I folded along the scored lines (both pieces in the opposite direction), and added sticky tape to the sides to create this shadow box card. Added some coordinating papers and decorated with the sentiment and snowflake. For the image on the inside, I simply stamped the trees using archival ink onto white card stock. Then I swiped the ink pad across the paper to add some color. I also added some frosted lace stickle glitter to the trees and snowy ground. I wanted a little more contrast, so I decided to use part of the glorious song sentiment here and there on my top piece of card stock. Hello, A lovely project, I love the scene and the colour choice. A lovely style. Thank you for joining us this month with our first challenge at A Crafty Mess Good luck. We would love to see you again next month. This is gorgeous Ellie! I love your shadowbox design and the beautiful scene you've created!! I have the same problem with step-by-step photos ... if I need them, I often have to go back and make it a second time ... love your fun shadowbox design ... so very glad you joined us in the Great Outdoors at Jingle Belles. WOW this is a darling card. Love that trees stamp you used, too. Great design. A great card - thank you for sharing it with us at Christmas Stampin' All Year Long. Thanks for joining us at A Crafty Mess and hope we'll see you again for the next challenge.